In order to maintain the safety of personnel and operations, as well as make maintenance easy, wire identification is required. Wire identification is a cost-effective and time-efficient, making it easy for an operator to quickly identify wires, their end points, and their purposes. Wires are marked either directly on the wire or onto a wire identification sleeve with a description of the wire. This description usually involves a part or reference number, as well as the wire’s origin or destination. It can also include a logo, a bar code, or a color code to further identify the wires. Omega Leads, Inc. provides a variety of wire identification services to complement our custom wire harness and cable assembly products. We can add numbering, lettering, your company logo, and more to deliver a custom wire harness or custom cable assembly that matches your specific requirements. Request a quote today or contact us to learn more about our custom wire marking and wire identification capabilities. 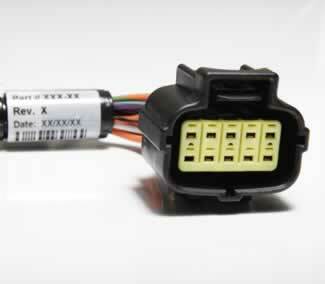 Simply put, we can add nearly anything you need printed on your custom wire harness or cable assemblies. Spiral or longitudinal striping is another popular option—an endless array of color combinations are available that can help you better identify individual components in your custom cable assembly. Custom wire labels are a cost-effective way to eliminate errors and streamline your production department. Adding unique identification to each wire in a harness or custom cable assembly makes it easy for your production team to identify individual leads, turning a potentially troublesome bundle of wires into an easy-to-work-with assembly that has a basic assembly guide built right in. Wire identification also makes repairs, maintenance, and part replacement in the field easier. Field technicians can easily see what’s what and what goes where for faster and more reliable service, with less downtime. Our in-house application engineering team is available to help you overcome any design challenges or to optimize your custom wire harness and cable assembly designs for faster and more cost-effective manufacturing. We can create prototypes of your custom cable assembly that enable you to test your design for fit, form, and function, with quick turnaround capabilities that help you take your design through multiple iterations so you can finalize the design quickly and get started on full-scale production to meet your deadlines. Like all our manufacturing practices, our wire identification processes are designed to meet IPC/WHMA-A-620 quality standards. We are UL and CSA certified, and ISO, RoHS, and WEEE compliant. Every Omega Leads custom wire harness and custom cable assembly is * made in the USA. 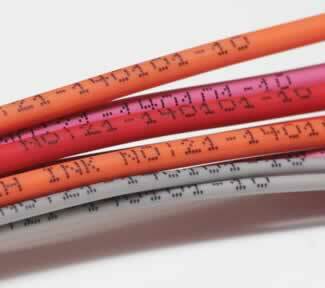 Custom wire labels are a superb addition to your custom cable assembly or wire harness. Request a quote on wire identification for your project, or contact Omega Leads for more information.